Rocrail uses this element to display a straight track on track diagram. ID A unique ID, which is used by Rocrail to address the element. This ID is usually assigned by Rocrail. You should be very careful, if you modify the original value. 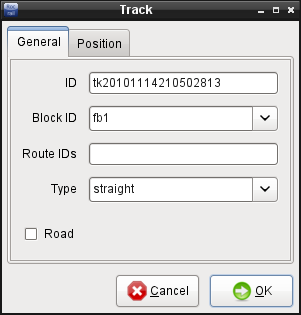 Block ID Allows you to assign the track to a block or sensor. Based on this assignment the track will be marked as occupied. As reference either the given block or sensor is used. NOTE: Not all track themes do support this feature. Type Type of track element Change the type of a track by specifying it here. You might change a curve into a straight. The tab 'Location' is described in chapter Track diagram elements. Curve This element is used by Rocrail to present curves in the track diagram. The handling and the dialogs of curves are the same as for straight tracks. Direction Currently this element doesn't have any impact on controlling the layout. It might be used to display defined directions in routes in the track plan. . Both directions Currently this element doesn't have any impact on controlling the layout. It might be used to display defined directions in routes in the track plan. Buffer This element presents a buffer in the track diagram and has the same properties as a straight track.